Two types of vibrations, diffusons and propagons, contribute to thermal conductivity in the polycrystalline structures. Credit: Yanguang Zhou and Ming Hu. The new material, which is a polycrystalline silicon nanowire, breaks two limits: the Casimir limit and the amorphous limit. The Casimir limit is a theory that describes the thermal conductivity of nanostructures, and breaking it means that the thermal conductivity of the new material is lower than the value predicted by Casimir limit theory. The amorphous limit is regarded as the lowest thermal conductivity of a material, since amorphous structures strongly scatter heat carriers. However, due to its unique nanoscale design, the polycrystalline silicon nanowire has a thermal conductivity that is three times lower than that of amorphous silicon materials. The researchers, Yanguang Zhou and Ming Hu at RWTH Aachen University in Germany, have published a paper on the polycrystalline silicon nanowire in a recent issue of Nano Letters. The researchers expect that the new material could be especially useful for thermoelectric applications. By converting heat energy into electricity, thermoelectric materials provide a way to capture some of the waste heat emitted by vehicle tailpipes, power plants, and manufacturing facilities, and then convert the heat into useful energy. In general, good thermoelectric materials are those that simultaneously have high electron conductivity and low thermal conductivity. Together, these two properties lead to a high overall heat-to-electricity conversion efficiency. 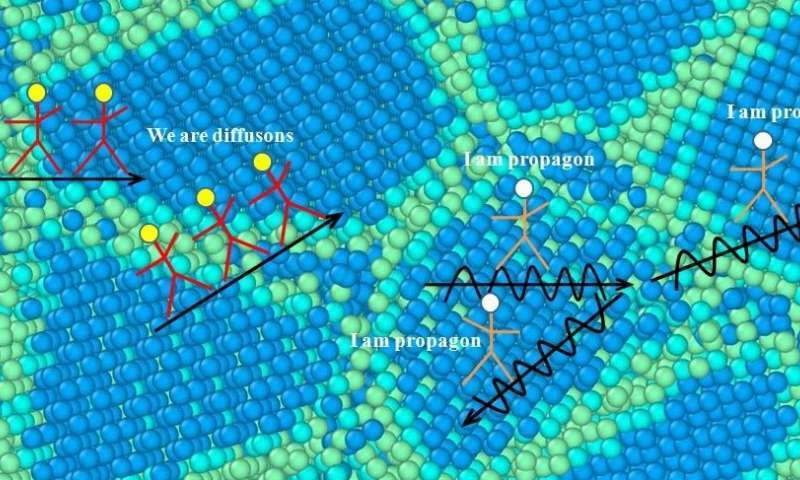 In the new study, the researchers focused on decreasing the thermal conductivity while maintaining the already high electron conductivity of silicon materials. "In this paper, we report a new structure, polycrystalline nanowire, which can reduce the thermal conductivity to a record low value, only one-third of its amorphous counterpart," Zhou told Phys.org. "If we keep the electric conductivity and Seebeck coefficient as constants, which can be achieved by doping the material, the efficiency of the polycrystalline nanowire to convert heat to electricity can be enhanced by 277 times with respect to its bulk counterpart." The key to the new silicon nanowire's low thermal conductivity is its polycrystalline form, which consists of many crystal structures of varying shapes and sizes in random orientations. Based on the average grain size (about 3 nm) in the polycrystalline silicon nanowires, the Casimir limit predicts that the thermal conductivity cannot be below approximately 3 W/mK. But the researchers' simulations show that the polycrystalline silicon nanowires have a thermal conductivity of just 0.7 W/mK. For comparison, this value is 269 times lower than that of bulk silicon, 77 times lower than that of pristine silicon nanowires, and three times lower than that of amorphous silicon nanowires. The researchers explain that an important feature of the polycrystalline structure is that the grain boundaries between crystals are discontinuous. As a result, the grain boundaries block and scatter the heat-transporting phonons, so that the phonons cannot move very far (only about 1 nm) through the material compared to how far they can move in other silicon materials (up to 1 µm), in which the grain boundaries form a continuous network. The results here raise the question of what the lowest possible thermal conductivity may be for silicon nanowires of any form. In general, there are two kinds of vibrations that contribute to thermal conductivity: propagons and diffusons. The researchers expect that it should be possible to completely eliminate the contribution of propagons by incorporating disorder in the form of nanotwinned structures into the polycrystalline silicon nanowires to minimize their transport. Diffusons, on the other hand, are caused by the inherent structural disorder of a material, so they cannot be reduced in this way. Nevertheless, by eliminating the contribution of propagons, the researchers expect that the thermal conductivity of the polycrystalline silicon nanowires can be further reduced by 20%. The researchers plan to pursue this goal in future work.